The Community Events Calendar is a feature of the South Carolina Music Guide’s website which allows musicians, venues, PR agencies, event promoters, etc., as a way to post and communicate various music related events occurring within the state of South Carolina. South Carolina Music Guide reserves the right to restrict or remove any content that is deemed a violation of this event calendar policy or any applicable law. Please allow up to 48 hrs. to post events to the calendar. ALL event postings will be reviewed by staff prior to submitting to the calendar to ensure policy guidelines are met. Please read our guideline policy before submitting an event to our Community calendar. 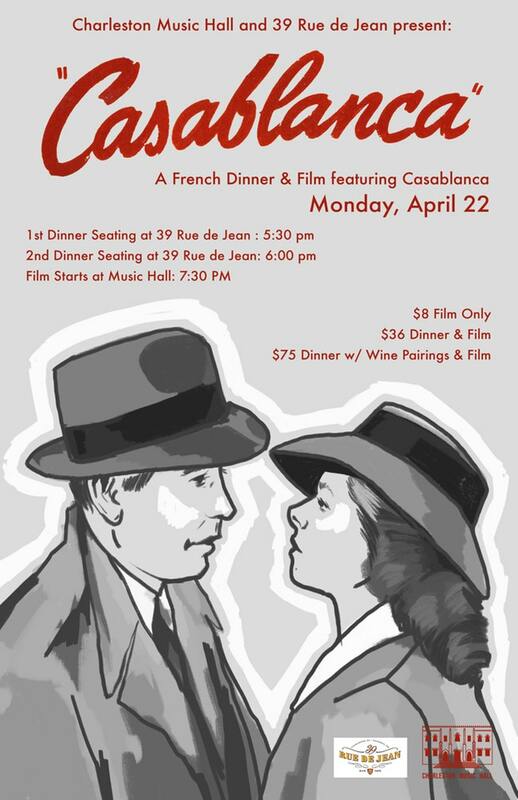 We are thrilled to be teaming up again with 39 Rue de Jean to present A French Dinner & Film Featuring Casablanca on Monday, April 22nd! Enjoy a 3-course prix fixe menu at 39 Rue de Jean (located next door to the Music Hall at 37 John St.) followed by a screening of Casablanca at The Charleston Music Hall.